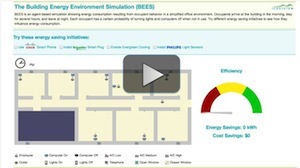 BEES (Building Energy Efficiency Simulation) is an Agent-Based Simulation showing energy consumption that results from occupant behavior in a simplified office environment. Occupants arrive at the building in the morning, stay for several hours, and leave at night. Each occupant has a certain probability of turning lights and computers off when not in use. Different energy savings devices can be added to the simulation to reduce overall energy consumption relative to baseline. 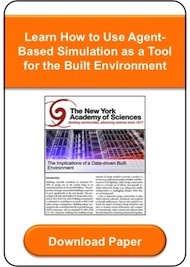 The current version of BEES, while highly simplified, illustrates the power of Agent-Based Simulation as a tool to support building design and management while taking into account occupant behavior. Click the simulation below, and try BEES yourself.